This Community of Hope jewelry design is to be worn by persons who have completed The Community of Hope training and have been commissioned with a certificate from their training center. (in stock, ready to ship) Click purple price link above to place order and make payment online. Checkout securely using credit card or PayPal account. US shipping is included in above price. (large pendant shown on cord. chains and cords sold separately) To add a chain/cord or to buy multiple items contact me to arrange purchase. 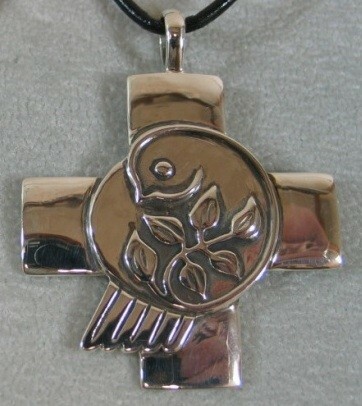 Nancy Denmark created this jewelry design by translating The Community of Hope's peace dove logo into a 3 dimensional form and incorporating it into the Greek cross. The logo of the former St. Luke's Episcopal Hospital is on the backside of the cross to identify the origins of The Community of Hope.